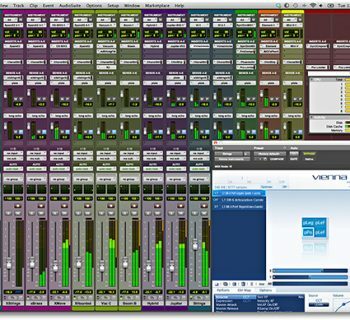 IK Multimedia offers a number of popular products, and perhaps one of their most well known is the AmpliTube family of plug-ins. Modeling numerous amps and effects for guitar players, it offers a great alternative to owning a room full of gear. 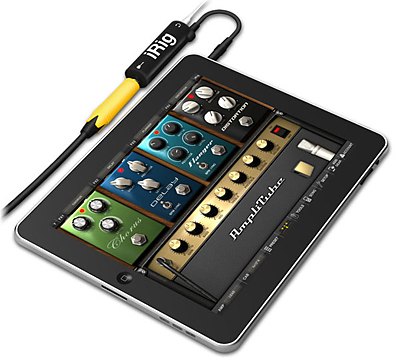 Going one step further, IK Multimedia has released the iRig, a combination I/O jack and software app for the iPhone and iPad. It’s a cool idea, as there isn’t a better conceivable way to practice electric guitar on the tour bus or in the hotel room. But how good is it in practice? We initially experienced a variety of problems getting iRig to work properly (the first iRig unit we received was defective), but after getting a second review unit and working through some technical glitches with the folks at IK Multimedia, we were eventually successful, loved using the product, and came to the conclusion that things do in fact work as advertised. Although we started the review with iRig version 1.0 on an iPhone 3GS, we ended up reviewing version 2.0.1 on an iPhone 4G, and there was definitely a sonic improvement in the new version. We could definitely see using this unique product in a number of creative ways — even for “serious” tracking purposes! 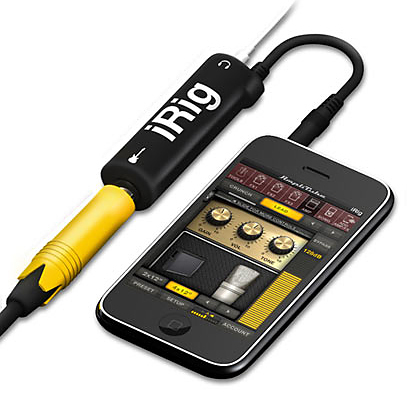 The hardware portion of the iRig contains a black ¼” jack for your instrument, and another 1/8” jack for headphones. There is also a short cable that gets inserted into the headphone input of the iPhone/iPad. One interesting thing to note: if you’re not using headphones, you are specifically warned to not use a 1/8” to ¼” converter to attach the iRig to a guitar amp, as undesirable feedback may result. If you want to plug into an amp (or mixer), it’s recommended to use an 1/8” jack to two RCA or two ¼” mono jacks. This was a minor disappointment as chorus, phasers, and flangers often sound best when used in stereo, but it posed no problem when connecting to a mixing board in our studio. The software part comes in three flavors, downloadable from the iTunes store: Free, LE, and Full ($free, $2.99, and $19.99 respectively). The free version includes three stompboxes, one amp+cabinet, and two microphones. The LE version includes five stompboxes, one amp+cabinet, and two microphones. 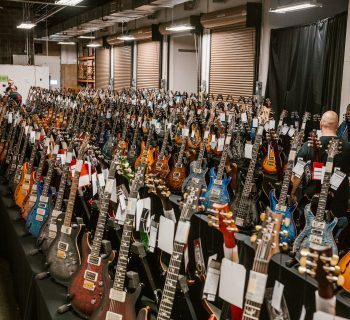 More gear can be added to the Free and LE versions through an in-app purchase of a-la-carte models, with stomp boxes costing $2.99 each and amplifiers+cabinets for $2.99 each. The Full version includes eleven stompboxes, five amps+cabinets, and two microphones. With AmpliTube fully loaded, you will be able to choose between five amps (clean, crunch, lead, metal, bass) and sixteen stomp box effects (delay, fuzz, distortion, overdrive, wah, envelope filter, chorus, flanger, phaser, octave, noise filter, compressor, reverb, parametric EQ, graphic EQ and limiter). 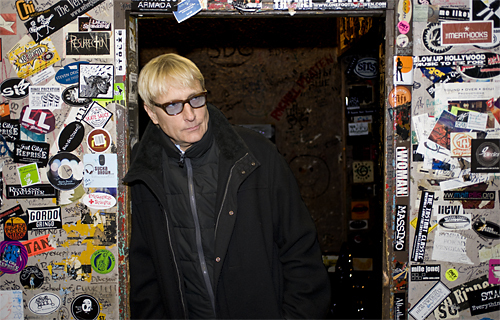 The processing technology was derived from the AmpliTube 3 plug-in for DAWs, and you can save and load up to thirty-six presets you have already created on your computer. AmpliTube for iRig still has the original’s chromatic tuner and metronome, but new features included are a built-in one-track recorder and a SpeedTrainer for slowing down songs without affecting pitch. You can also import up to fifty songs from your iPod or iTunes library and use them as backing tracks. In AmpliTube for iRig 2.0, you can also export your creations as high quality WAV files, or email them from your phone as MP3s. A further note about the recorder: the re-amping feature provides the ability to change the sound and tone of an original recording by applying a different set of effects after the track has been recorded without having to re-record it. Even more intriguing, the recorder in AmpliTube for iRig 2.0 can also be expanded to a full-fledged multi-track studio by adding a four-track recorder plus master effects section with reverb, equalizer and compressor (available as in-app purchase for an additional $9.99). Track controls include individual Volume, Pan, Apply FX, Send FX, plus the ability to import audio directly into each track. The bounce feature allows users to bounce all tracks to a single track, freeing up track space to record additional material for virtually unlimited recording ability. Those who grew up with four-track cassette recorders will love this! Ironically, the graphic displayed on the top of the screen above the fader section depicts a cassette with moving heads. Nice touch. Setup is easy: just download the app, plug in the iRig adaptor, your instrument, and off you go. Right? Well, yes. But just make sure that you have an “active” track selected in the recorder/mixing section or else you won’t hear a thing (which we learned the hard way, after upgrading from the first release to version 2.0 deactivated all tracks by default). Additionally, one of our other editors has been running AmpliTube 2.0 on an Apple iPad without any issues. Although not tested directly for this review, we do have confirmation of its reliability on that platform. The iPhone obviously has limited screen space, but iRig does a good job of making the most of it. Stomp pedals are easy to control, and the menus at the top of the screen scroll horizontally, so you can swipe your finger across the screen to access more menus/parameters. Further, we found the responsiveness of version 2.0 was better than that of version 1.0. 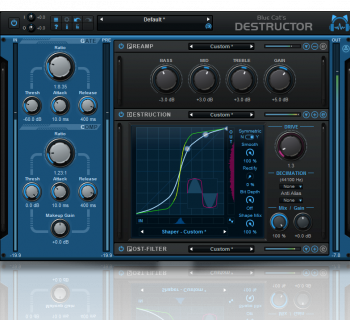 We also noticed the distortion sounds were improved — much less tinny to our ears than the original version. The other pedals also did their job effectively. There are nine multi-effects presets included, and the “Seattle” preset will certainly remind you of a certain grunge band from the early 1990’s that featured a naked baby in a swimming pool on their breakthrough album cover. The individual pedals are well designed, and as mentioned, the distortion and overdrive effects were much more satisfying than the original version. The noise filter did a good job of cleaning up some of the hiss one might hear on traditional pedals (especially when using a distortion pedal), and the chorusing and flanging effects were adequate. Fans of U2 will enjoy the delay pedal, and there are a few multi-effects presets that were somewhat reminiscent of The Edge’s sound. Interestingly, there is an octave pedal, which, while not glamorous, was effective. The wah pedal was unique in that you could “tilt” it for effect. When using the wah pedal, you have choices of On, Off, Auto, or Tilt. Tilt tries to emulate the actual way a wah pedal is used… by tilting the angle of the iPhone to increase or decrease the amount of wah effect as if it were a stomp pedal! While this is a neat feature (perhaps if you were creative and attached the iPhone somehow to a foot controller), if you like to play the guitar with both hands you’re going to need to grow an extra appendage to use this feature. Keyboard players don’t need to feel left out with iRig. One interesting way to use Amplitube would be on a Rhodes piano. For example, you could plug in the Rhodes piano’s mono output into the iRig, and then into an amp or mixer. We used the “Trem Blackface” preset with a Rhodes hooked up to an amp (in mono) and it rendered a decent version of The Doors “Riders of the Storm.” Had it been hooked up to a stereo mixer, it likely would have sounded even better. Ironically, the new four-track recorder had us almost more excited than the other parts of the program. A cool feature is that you can actually use the built in mic on the iPhone to record. For example, you can record a rhythm guitar track, then record a solo guitar track, and then use the built in mic to record scratch vocals on top of the guitars! The ability to do this — and export the tracks as WAV/MP3 files — makes iRig a very useful portable studio. We do, however, wish that the four-track recorder had a dedicated click/metronome track. To toggle the metronome, you have to leave the recorder screen and go to the setting screen, which was cumbersome. The Song feature worked very well, too. We imported “Back in Black” by AC/DC from our iTunes library and slowed it down while preserving the pitch. For those of you about to take iRig with you on tour for hotel songwriting sessions… we salute you. iRig LE: $2.99, amps and effects downloadable for $2.99 each a la carte.